WALLA WALLA, Wash.--(BUSINESS WIRE)--Two of the common gripes about online monthly subscription box services: too much of the same stuff inside, or just too much stuff you don’t want. Neither will be an issue with the latest brand to offer a monthly subscription service: Nocking Point Wines, the world’s only celebrity-curated wine club. Every Nocking Point wine is unique: the narrative of each vintage is authentic and deeply personal, the wine label’s art is inspired and original, and the wine is exclusive, available only through Nocking Point subscriptions. 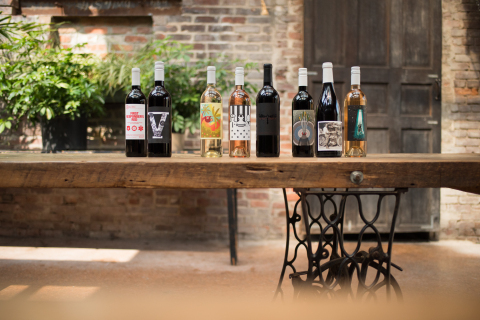 Nocking Point, co-founded by actor Stephen Amell (of superhero show “Arrow”), creates the wines by uniting a pop culture aficionado’s love of the grape with artists and personalities who own their unique spot in pop culture, and share the same appreciation for premium wine. The first new wines that subscribers will enjoy in January 2019 come from Nocking Point’s collaboration with actors Tom Welling and Michael Rosenbaum (respectively, Clark Kent and Lex Luthor of the Superman origins series “Smallville”). Their two wine offering, dubbed “Pure Evil,” includes Welling’s ‘pure’ Cabernet Sauvignon and Rosenbaum’s ‘evil’ Sauvignon Blanc. There are a limited number of subscription spots for “Pure Evil” and Welling and Rosenbaum encourage wine lovers to purchase their wines before they sell out completely. And actress and “Arrow” co-star Emily Bett Rickards, whose Pacific Coast Pink sparkling rosé is the featured wine in Nocking Point’s subscription box this December. In addition to wine, Nocking Point also offers a selection of artisanal coffees from Walla Walla Roastery and branded merchandise sold individually or as part of the subscription options. Joining is as simple as a few clicks on www.nockingpoint.com. Do something original for yourself, friends or family and subscribe. Nocking Point Wines was founded by actor Stephen Amell and entertainment executive Andrew Harding. Inspired by their mutual love of great wine, the two friends and now business partners founded Nocking Point to celebrate and cultivate their interest in winemaking, and to further connect with Amell’s fan base -- a legion of enthusiasts that consistently make Amell one of the biggest draws at Comic-Con and similar events. Nocking Point’s premium quality wines are produced with an all-star team of winemakers in Washington State and California, bringing the best of West Coast wines to consumers across the country.